Shaped Charges are efficient in perforating armor and other materials. They operate by using the energy of an exploding charge of high explosive. The high explosive is usually shaped to have a cavity in the form of a cone, with the cavity lined with a copper liner. 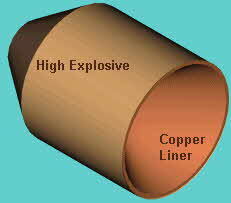 When the charge explodes, the cavity collapses and the copper is squeezed into a narrow, very fast, jet of particles. Though most uses of shaped charges are for armor piercing purposes, some are used in construction, as highly efficient metal cutting tools. 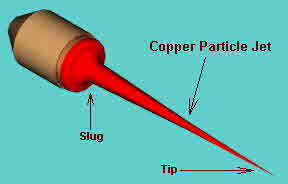 A copper jet is formed because at the time of the explosion some particles of the copper liner acquire a different velocity from other particles. This causes the faster particles to move away from the slower ones, thus creating an ever elongating jet. A tip of a typical jet travels at speeds approaching 10,000 m/sec (30,000 ft/sec). The slug travels at much slower velocities - 1000 m/sec (3500 ft/sec). A shaped charge jet carries a significant part of the energy released during the original charge explosion. Most of this energy is concentrated in a fairly thin stream of metal particles , traveling at high velocities. This makes for a formidable weapon. When this stream impacts on a surface standing in its way, it is capable of penetrating a significant thickness of high strength materials. If left undisturbed - without impacting on any obstacles - such a jet may keep its shape for lengths ranging from about 1.5 meters (for very small charges) to several meter for relatively large antitank missile charges. Beyond these lengths a jet will disperse due to inaccuracies in the original shape, which introduce velocities perpendicular to the main direction of the jet. If an armor steel plate is placed in the jet's path, it will penetrate the plate and keep moving beyond it, carrying with it particles of the penetrated plate. A small shaped charge, approximately 50 mm in diameter and 90 mm long, can penetrate 250 to 300 mm (10" to 12") of armor steel. Larger charges, such as the ones used on the US TOW antitank missile, can penetrate 500 mm (20") of steel. Materials other than steel (such as ceramics) are not significantly different in their behavior and offer no effective protection, if used in classical static arrays. Reactive armor designs are based on the assumption that dispersing the shaped charge jet, so that it impacts on a large are of the structure behind the reactive armor, will reduce the jet's penetration into it. To achieve meaningful dispersion of a fast moving stream of copper particles it must be met with a fast moving mass of material, moving at an angle to the jet's motion. Due to exchange of momentum between the moving material and the jet, the jet will be deflected and partially dispersed. The simplest engineering fulfillment of the above requirements is in the form of two metal plates sandwiching a layer of high explosive. This is a basic reactive sandwich. The "reactive" in the name refers to the fact that the explosive material reacts to the jet's impact and explodes, propelling the plates outwards, into the jet's path. As can be seen in the photograph on the right, the plates (usually called "flying plates") are cut by the jet. This causes a decrease in total jet penetration of the target. This simple design is relatively effective - it is usually about 20 times more effective that armor steel. Such designs, when deployed on main battle tanks will protect them against most shoulder launched antitank rockets. Its efficiency sharply decreases if the jet impacts the flying plates at any angle different from the one for which the armor was designed. The very fast tip of the jet penetrates the plate array before the explosive between the plates reacts, and thus is unaffected by the reactive armor. The slug, traveling at much slower velocities arrives after the plates moved out of its way, and so is also unaffected. The flying plate facing the vehicle impacts it with significant energy and may seriously damage a lightly armored APC. Any friendly troops close to the event are likely to be injured by the secondary explosion of the armor. 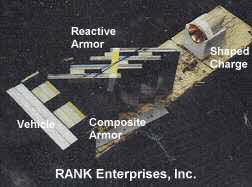 RANK Enterprises uses its advanced technology, know-how and experience to design reactive armor that solves the problems presented by the threat of shaped charges. This armor is useful for lightly armored vehicles and in situations where a minimal amount of explosives and protection against both shaped charges and normal kinetic armor piercing projectiles is important. This armor will also defeat warheads with multiple shaped charges. 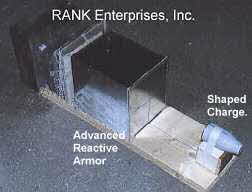 Our armor uses both reactive (explosive) technology and ceramic/metal composites. In addition it utilizes shock wave interference techniques to enhance jet dispersion and to capture the hypervelocity tip of a shaped charge jet. The simple test arrangement on the left is a illustration of some of these principles as applied to armor. This armor has an excellent multi hit capability, due to the small explosive module sizes and is very efficient in defeating both shaped charges and kinetic projectiles. Armor suits for specific vehicles are designed so that the explosive holding modules can be removed and attached easily, thus leaving the vehicle with some kinetic protection even when the explosive package is not installed. A typical application, as shown on the right, includes a ceramic composite attached to a vehicle, with a reactive component installed on top of it. The ballistic efficiency of this application is approximately 35 times better than armor steel. It makes a vehicle with a 25 mm (1") aluminum wall impervious to hand held antitank rockets and armor piercing projectiles up to 30 mm caliber (RARDEN) at 1700 m/sec.